Bonded WeatherMaster Products sells its quality products through a network of knowledgeable distributors and contractors who provide products and service at the local level. We invite you to be a part of our family. Our windows and doors incorporate the newest vinyl, glass and aluminum technologies and perform better than most of the industry’s best-known name brands. As a Bonded replacement window, patio door, storm window and storm door dealer, you strive to provide the best value for your customers. Offering Bonded WeatherMaster Windows and Doors gives your customers the advantage of owning the best windows and doors available! We invite you to explore our site to learn more about our company and our products. Contact us if you you want to learn more about becoming an Authorized Bonded WeatherMaster Window and Door Dealer - we'd love to hear from you! To enquire about becoming a Wholesale account, email, fax, or give us a call. You can also fill in the form below and fax it. What is your business area? We sell wholesale to qualified accounts. exceed the ability of a homeowner. Product mix, from Economy to High Performance. The best quality control possible on both high volume and low volume orders. Quick production times at our modern plant in northern New Jersey. Rush services no extra charge. We purchase from accredited, long term established USA vendors, assuring only quality parts go into our products. 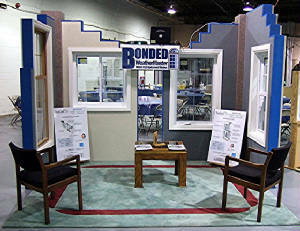 Easy ordering using our faxable forms or convenient Email:sales@bondedwindows.com. Call for complete warranty package! Local New Jersey, New York, Penna. and Conn. plus national and international sales. Super custom windows available in many different shapes and sizes! for special discounts on retail priced windows and doors. Call the office toll free for details at: 866-360-0100.